A Heart's Desire: I want it now!! I wanted it, had to have it, and I wanted it now! 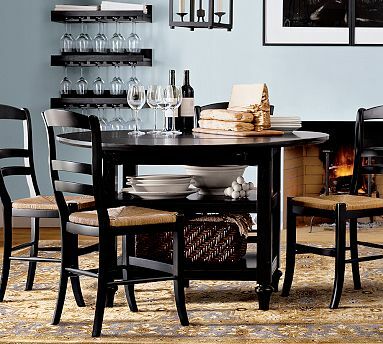 I basically had temper tantrums over the one the only Pottery Barn Shayne Table. It became an obsession and I pined for it for 4 years! I agonized over the color...I wanted black, then I wanted white, white with maple colored chairs, then Pottery Barn introduced the mahogany stain. It was perfect, and I wanted right then! The problem with all of this wanting NOW was that I had no moolah for it. The table was $599, the chairs $179 each! Totaling $1315, not including shipping or delivery fees!!! That is a lot of money. 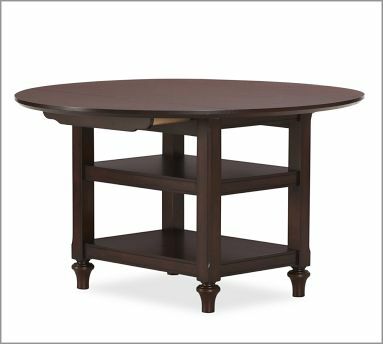 I saved but something always came up and I could not stomach spending $1315 on a table when we had a table that served its purpose. My husband really couldn't stomach the cost, he is a man after all, "we have a table" was a phrase I came to despise. I knew I didn't need it, but it was one of those things that sucked me in and I knew it would be perfect. I schemed for months on how to make it work. I figured buying the chairs from the store would save me the shipping on them but that was really the only way I could cut cost. But one day the Pottery Barn Gods shined down their love on me and the table was on sale for $499 with NO shipping!!!! I panicked! I just knew it was being discontinued and I would never have it. I'm pretty sure I lost sleep over it, but a few days later I remembered that we get cash back gift cards from our credit card purchases and it had been a really long time since we had claimed any. I checked and we had $400 in gift cards! So I claimed the cards, waited a week, received them, then hit the purchase button online. Pottery Barn would not accept my gift cards!!! So I went to the store had to purchase $400 in Pottery Barn gift cards with my Visa gift cards and then the store associate had to purchase the table online for m, whew!. I had finally purchased it, I just had to wait 3 more weeks. Then the day it was supposed to be delivered it SNOWED!!! I could not believe the agonizing delays, but the driver arrived at my house around 9 PM the day of delivery. I just wanted to curl up and sleep on one of its shelves, it was finally mine. This was over a year ago. It sat so lonely in our dining room for so long because I still had no money for chairs and I still didn't want to spend $700+ on chairs. 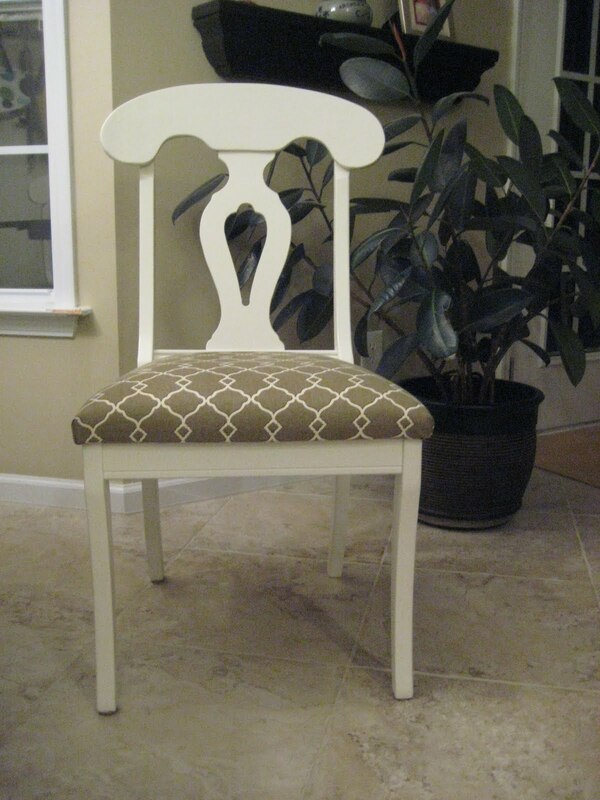 Then back in September I went to one of my favorite thrift stores, the Thieves Market to look for a planter and found a dining set and the chairs were almost identical to the Pottery Barn Napoleon Chairs except the color. The set could not be split so it was a table and chair deal, for $250. So for $500 less than the Pottery Barn chairs I got 4 chairs and a table. I decided to paint the chairs white because I wanted to lighten up the kitchen and because it was easier to paint than stain. I also choose a fabric and re-covered the seats. So here is the after. The only real difference in the chairs I longed for and the very thrifty, made my pocketbook smile ones are the keyhole on the back. The chairs I ended up with have a little more detail, see below. 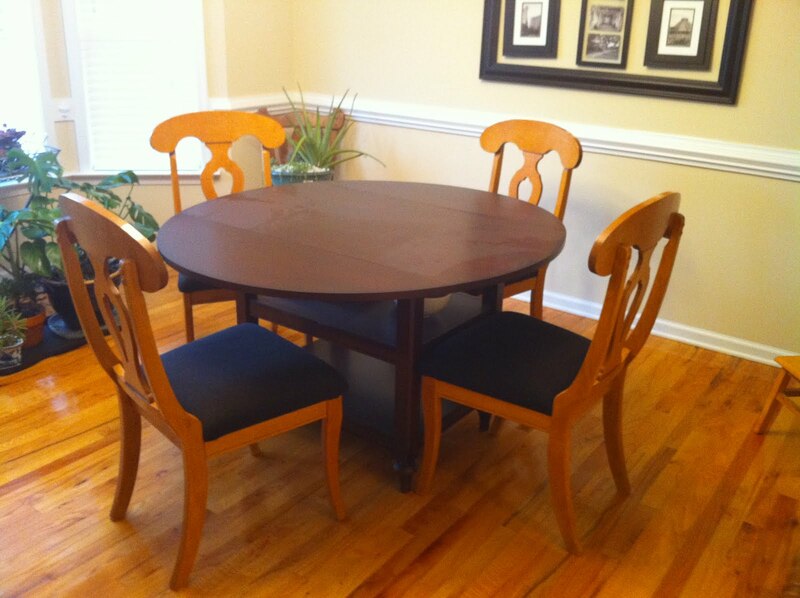 I could not be happier with the table and chairs and I plan to have them for a VERY long time. 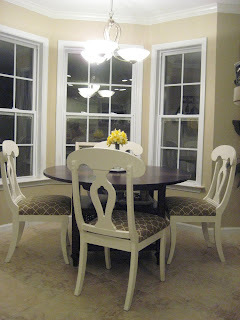 See this post for the thrifty table makeover. And the great thing is that now the dining chairs and kitchen chairs are interchangeable with the two tables, so if I want to spice my decor up or just need a change that will make for an easy fix. I love how your chairs turned out. Personally, I think they are cuter than the ones in the original picture. Great job! I love your post and I love how it all turned out. I so hear you about wanting something so bad and obsessing about it. I found you over at Centsational Girl and I am now your latest follower. 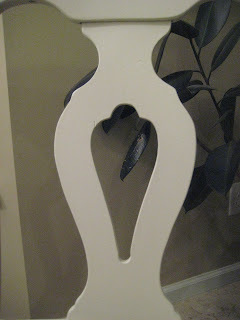 I would love if you would come and check out my blog and follow me back at www.diybydesign.blogspot.com. Thanks so much. 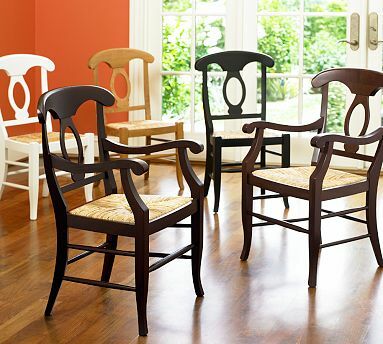 I also think the chairs you wound up with are much better then the pottery barn ones. Very cute! So glad you were able to get your table - I think it looks great with the white chairs. I am still enjoying this set very much. I worried about the white chairs with a dark table but it really looks great. I agree. Your chairs are much nicer than PB chairs. I enjoyed the table story. How comfortable is the table? For instance do your knees run up against the shelf? Hey Bekah, it is comfy, your legs do bump the table a little with the chairs I have, but it's not enough to bother. My chairs are not the pottery barn ones and the seat is a little longer on my because I measured.